Play'n Go has released yet another new slot that is heating up the action at online casinos that offer the Play'n Go software. Returning to a more traditional design, the new Aztec Warrior Princess slot is built around a lost Aztec culture deep in the jungles of South America and features a creative serious of features and symbols. 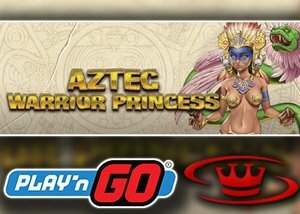 Engineered with 5 reels, and 25 paylines, Aztec Warrior Princess offers an easy betting selection starting at $0.25 per spin and increasing to its maximum bet of $25. To set the theme, its main character symbols are based on animals that were important to the Aztec culture and include a leopard, know for bringing good luck and fortune, an eagle, frog, and snake. However, it is the bonus symbols that truly show the skill in creativity that comes from Play-n Go with three skulls, a Warrior Princess and gold medallion making up those responsible for bonus features. The first game feature is the wild, with this being offered in the form of a gold medallion. It can complete wins when joining regular game symbols. It also will pay wild wins when three or more appear left to right. The Warrior Princess with her jewels and headdress will be the one responsible for triggering free spins. When three or more appear, ten free spins will follow, as will scatter pays. Any two will begin to award wins with the largest being 300x the bet when five appear. Unfortunately, this s not a feature that can be re-triggered. The last of the three features is the bonus game and will be activated when three or more skulls appear on the screen. This whisks you off to a new screen that displays various skulls and will award wins based on selections made. One of our preferred casinos offering the new Aztec Warrior Princess slot is Casino Room. New players will be enticed by its free no deposit 20 free spins and its welcome bonus package offering up to $700 in bonuses. Powered by leading slot developers such as Play'n Go, NetEnt and Microgaming, it offers an abundance of exciting slot titles ready to provide you with high energy gaming, all through a web-browser without the need to download software. You can learn more about this established and exciting casino by reading our detailed Casino Room Bonus Review, and while visiting, why not register and take full advantage of our Play'N Go free spins bonus!